Batcave Toy Room - Better Living Through Toy Collecting: No Retro Action DC Heroes Green Arrow Until December 23. No Retro Action DC Heroes Green Arrow Until December 23. 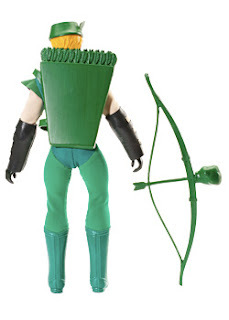 I just went to purchase my Retro Action Green Arrow from MattyCollector.com to find it will not be available until December 23 now. What a blow below the belt. Did I miss something? Wasn't it to be available on December 15 in time for Christmas? 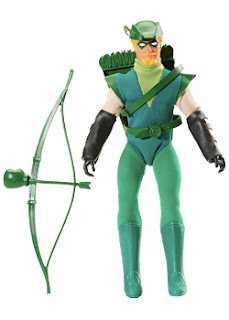 The Retro Action Green Arrow is to be the first release of the "re imagined" Mego World's Greatest Super Heroes figures we loved so much as kid, and still do today. Mattel will release three waves of four heroes in each wave. The next four DC characters will released this Spring at Toy R Us and other retailers. The next four will be: Superman, Lex Luthor, Sinestro, and Green Lantern. I guess I'll be up bright and early on the 23rd to try again.